This quaint park is named after Joe Sabba (1916-1999), a war veteran and local activist who dedicated the greater part of his life to the Sunnyside community. Sabba served in World War II as a tailgunner in the Army Air Corps. After the war, he spent much of his life serving his neighborhood. In 1946, he married Sylvia Eliassos and bought into a partnership with the Woodside Herald, a local weekly newspaper. Later that year Sabba founded a neighborhood youth organization called the Sunnyside Drum and Bugle Corps. Sabba presided as editor of the Woodside Herald for many years before passing on the position to his son, Buster. For over 25 years and until his death on May 26, 1999, Sabba also served as the chairman of the Sunnyside Flag Day Parade. The City acquired this land, at the intersection of Queens Boulevard, 48th Street and 49th Street, on October 18, 1913. For 20 years, the land served as mall space on Queens Boulevard. 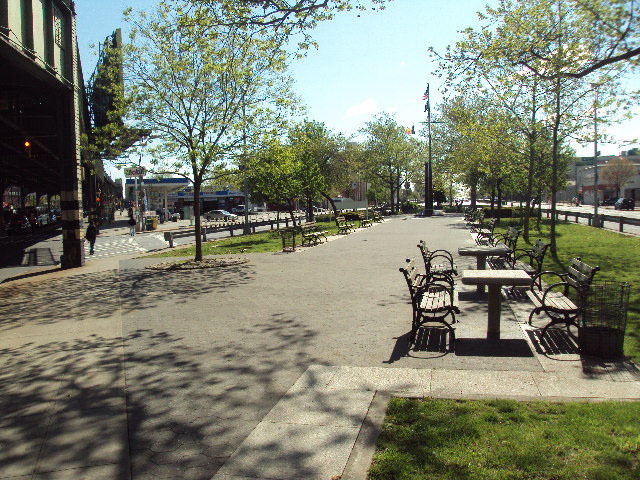 Neighborhood residents commonly referred to it as “Roosevelt Plaza,” after the adjacent Roosevelt Avenue. The park was later known as Sunnyside Veterans Triangle, in recognition of locals who served in the nation’s armed forces. The original Sunnyside town was named after the farm of the same name that previously occupied the town’s site. Legend has it that Harry Bragaw, a well-known opera singer and music critic, owned that farm, which was graced by the rising sun each clear morning. On October 18, 1933, the City transferred this site to Parks. C.B. Williams, president of the landscape division of Queens Parks, authorized the enlargement of the park in 1938. In 1941, following the attack on Pearl Harbor, a local law designated the park Veterans’ Memorial Square to honor World War I veterans and to illustrate the neighborhood’s solidarity behind those men who would soon be heading off to combat in World War II. The triangle contains light poles, concrete and asphalt walks, a flagpole and yardarm displaying the U.S., City of New York, and Parks flags, and is colored with eastern burning bush (Euonymus atropurpureus), a glossy, deep-green shrubbery that turns a vivid plum-purple during the winter.